Citation Information: J Clin Invest. 2014;124(2):543-552. https://doi.org/10.1172/JCI71858. Th cells are the major effector cells in transplant rejection and can be divided into Th1, Th2, Th17, and Treg subsets. Th differentiation is controlled by transcription factor expression, which is driven by positive and negative cytokine and chemokine stimuli at the time of T cell activation. Here we discovered that chemokine platelet factor 4 (PF4) is a negative regulator of Th17 differentiation. PF4-deficient and platelet-deficient mice had exaggerated immune responses to cardiac transplantation, including increased numbers of infiltrating Th17 cells and increased plasma IL-17. Although PF4 has been described as a platelet-specific molecule, we found that activated T cells also express PF4. Furthermore, bone marrow transplantation experiments revealed that T cell–derived PF4 contributes to a restriction in Th17 differentiation. Taken together, the results of this study demonstrate that PF4 is a key regulator of Th cell development that is necessary to limit Th17 differentiation. These data likely will impact our understanding of platelet-dependent regulation of T cell development, which is important in many diseases, in addition to transplantation. Pf4–/– mice have an exaggerated Th17 response to cardiac transplantation. (A) Hearts from BM12 mice were transplanted into WT or Pf4–/– mice and harvested 35 days later. Pf4–/– mice had extensive inflammatory infiltrates (representative histology). (B) Heart grafts from Pf4–/– mice had decreased expression of mRNA representative of a Th1 infiltrate, no change in Th2, and (C) increased Th17-associated mRNA (n = 5–7; mean ± SD; *P < 0.01 vs. isograft). 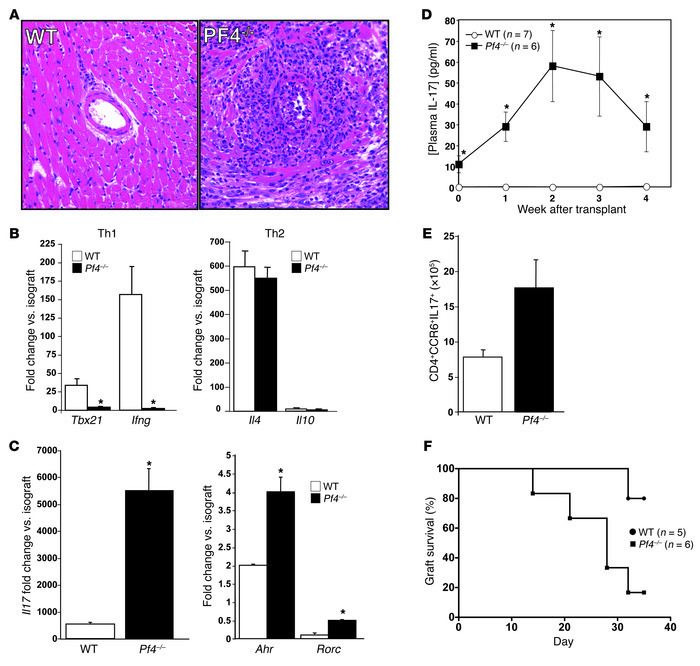 (D) Pf4–/– mice had increased plasma IL-17 and (E) increased Th17 cells in the spleen after cardiac allograft (5–7; mean ± SD. *P < 0.01 vs. WT). (F) Heart transplants in Pf4–/– mice had shorter time to loss of transplant heartbeat. WT and Pf4–/– were transplanted and time to rejection determined by loss of palpable transplant heartbeat (P < 0.03, log-rank test).